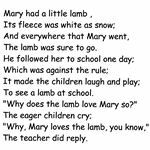 Students enjoy the classic Mary Had a Little Lamb rhyme. 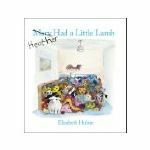 A children's favorite with a little twist, students will learn this poem to learn both rhyming words and word families. Monday: Post the words of the rhyme on chart paper. Show students the different texts of this rhyme (there are many!) Read the nursery rhyme. Discuss the setting of the nursery rhyme. Where might Mary live? 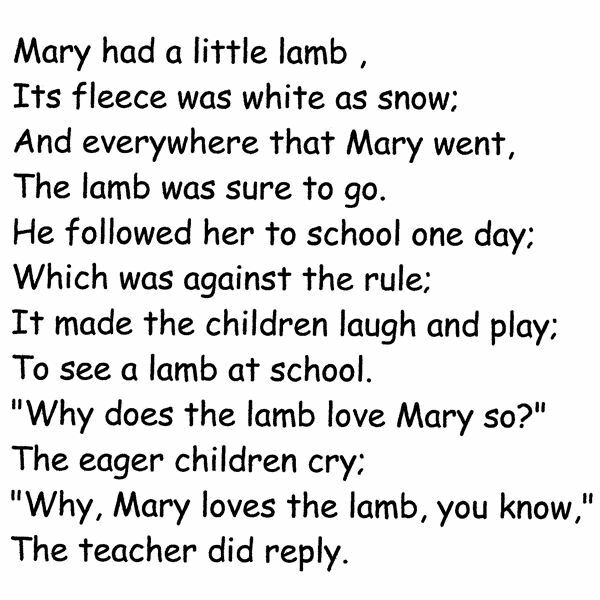 From the nursery rhyme (full text below), what can we learn about the nature of this pet and of Mary? 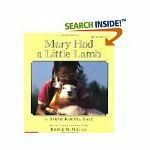 It is thought that the origin of Mary Had a Little Lamb is American. The nursery rhyme was first published as an original poem by Sarah Josepha Hale on May 24, 1830, and is thought to be inspired by an actual incident. Ask the students if they think it is true. Speak to the students about what they might think if a student brought a pet, namely a lamb to school. Tuesday: Discuss new vocabulary words from the rhyme and them add to the list of new words learned from other nursery rhymes in this series. What is fleece? It is the coat of wool covering a wool-bearing animal. Discuss the simile, "its fleece was white as snow" (meaning its wool was very white). This would be a great day to create a textured lamb with cotton balls craft or to bring an old wool sweater to teach about the history of using wool for clothing and how it is dyed. Wednesday: Find the rhyming words in the poem. They are snow and go, rule and school, play and day. Thursday: Create a word family chart using the root, -ow (snow, grow, blow, tow, row, know, low and so on). Create another word family chart using the root -ool (for example, school, pool, drool, cool, tool, wool, stool and so on.) Create a word family chart using the root -ule (mule, rule, yule, and so on). This may be a small group of words and words students may not write frequently so use your judgment to include it or not. The -ay family was covered in another nursery rhyme lesson in this series. Friday: Students love to write about pets, whether or not they have one! I once had a girl in class who always wrote about her dog. When I told her mom about it, her mom said that they did not have a dog, but that the little girl really wanted one. Allow them to rewrite the nursery rhyme using their own name and own pet. 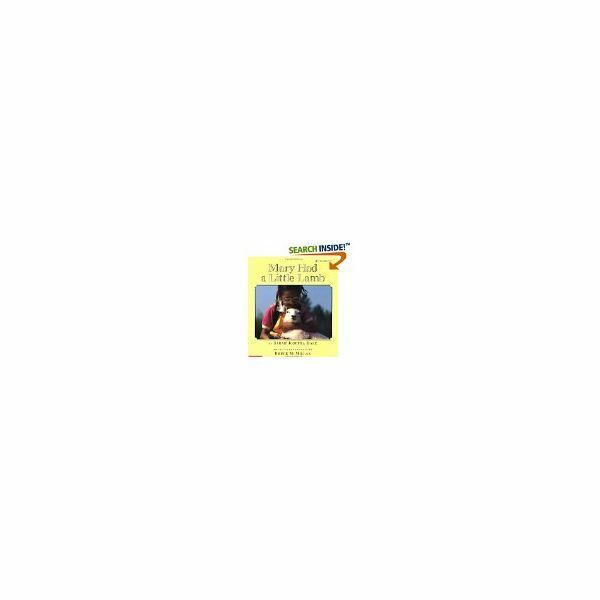 For example, Ronny had a little dog.... Let the students study and discuss the book collection of the Mary Had a Little Lamb nursery rhyme that you have compiled. As a part of a series on learning new words from nursery rhymes, students will really enjoy practicing with this old favorite.